The movement toward “humanely raised food animals” simply assuages our guilt more than it actually reduces animal suffering. If we truly want our actions to reflect the compassion for animals we say we have, then the answer is very simple. We can stop eating them. How can this possibly be considered anything but a rational and merciful response to a violent and vacuous ritual? 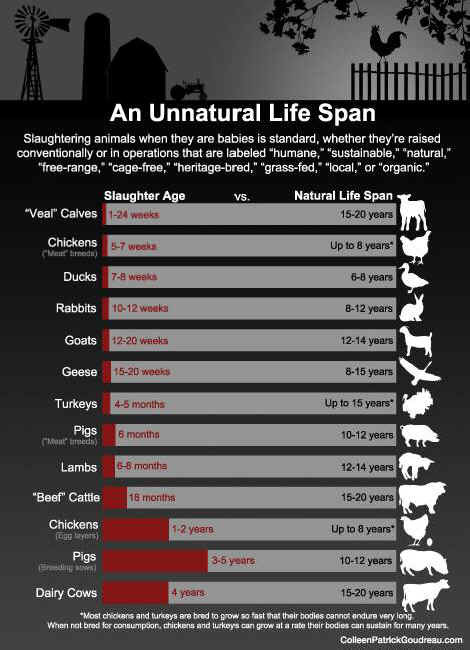 I have yet to meet a non-vegan who doesn’t care about the treatment of animals bred and killed for human consumption. Even people who eat animal-based meat, aware on some level that the experience is unpleasant for the animals, will tell you they object to unnecessary abuse. Nobody wants to support cruelty, and nobody wants to believe they’re part of it. Instead, they declare that they buy only “humane” meat, “free-range” eggs and “organic” milk, perceiving themselves as ethical consumers and these products as the final frontier in the fight against animal cruelty. We bring into this world (only to kill) over 10 billion land animals every year just to please our palates and honor the status quo, yet we never question the absurdity of this societal ritual. Instead, we absolve ourselves by making what we think are guilt-free choices, failing to recognize the paradoxical impossibility of “humane slaughter” and also ignoring huge steps in the cradle- (domestication)-to-grave (our bodies) process. When we tell ourselves we’re eating the flesh and secretions from “humanely raised animals,” we’re leaving out a huge part of the equation. The slaughtering of an animal is a bloody and violent act, and death does not come easy for those who want to live. The fundamental problems we keep running into do not arise merely from how we raise animals but that we eat animals. Clearly we can survive—and in fact, thrive—on a plant-based diet; we don’t need to kill animals to be healthy, and in fact animal fat and protein are linked with many human diseases. We know this. We know it instinctively, and the medical research supports it. What does it say about us that when given the opportunity to prevent cruelty and violence, we choose to turn away—because of tradition, culture, habit, convenience, or pleasure? We are not finding the answers we are looking for because we are asking the wrong questions. Every animal born into this world for his or her flesh, eggs or milk—only to be killed for human pleasure—has the same desire for maternal comfort and protection, the same ability to feel pain, and the same impulse to live as any living creature. There’s nothing humane about breeding animals only to kill them, and there’s nothing humane about ending the life of a healthy animal in his or her youth.